"Rise of the Planet of the Apes", as its title conveys, is an origin film to a possible sequel or even a trilogy. As such, the reboot film might test your patience in terms of what it is willing to give away (in terms of plot that is) to its viewers. Yes, there are subtle hints and clues to the keen-eyed watcher but most will see the film slowly plodding away until credits time. Although this is the case, "Rise of the Planet of the Apes" will be best remembered as being polished not only in visual effects but what lies beyond it. The full review is right after the break. Will Rodman (James Franco) is currently testing a cure for Alzheimer's Disease. A disease his father is struggling to live with. Lab tests has shown that his "cure" works perfectly with chimpanzees but when one chimp goes berserk, the whole project is shut down and all test subjects are ordered to be terminated. He soon discovers though that one of the test subjects had bore a baby and he decides to take it home for safety. As fate would have it, the baby chimp named Caesar (Andy Serkis) had the cure carried over to him genetically which makes it develop human-like intelligence. Caesar would soon grow-up and learn that being locked up and ordered by humans is not "home". It's really no surprise that the most memorable thing about "Rise of the Planet of the Apes" would be the virtual chimpanzees especially Caesar and it does prove to be a revolutionary film when looked at this aspect alone. It brings a new dimension to not only the visual effects department but also film-making as a whole. No thanks to a wonderful performance by Andy Serkis which brought an uncanny human dimension to a chimp which prosthetic makeup won't ever mimic. 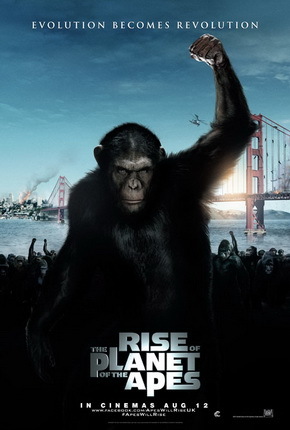 Another good thing about "Rise of the Planet of the Apes" is how its pacing and build-up is an asset. Some may complain that the film will be too slow but in fact, it is one of its assets. From a scene in Africa to Caesar developing intelligence to him learning to be free, the movie just snowballs into an epic finish but, and here's the catch, a lacking end does stifle the whole experience drastically. One must realize that the film proclaims that it is an origin film, one that will build-up to something else in the near future. The film will show Caesar and his development to a "human-like" being but never really goes beyond that. If you expected "Rise of the Planet of the Apes" to be a wholly rewarding experience then it will disappoint you greatly.